“Sometimes, dead is better.” This is the haunting tagline of Stephen King’s Pet Sematary, which I made myself finally finish last night. And despite having read it before, I am still utterly horrified by it and I expect it’ll take me a few days to fully recover. Let’s get through this review quickly so I never have to think about this book again. That same day, Jud leads the family—Louis; Rachel, his wife; and Ellie and Gage, his young daughter and toddler son—through a path in the woods near their house that leads to a somber little spot called the “Pet Sematary,” where, for generations, local children have been burying their pets. Rachel, who has never been comfortable confronting death, is horrified and later forbids Louis from taking the kids there again. And although Louis believes that death is part of life and that the kids must come to term with it someday, he agrees. But beyond the Pet Sematary lies a secret: the kind of small-town secret of which everyone knows but no one speaks; the kind of secret that only a grizzled old-timer, like Jud Crandall, would believe in; the kind of secret that has the power to destroy you. And now that Louis Creed knows exactly what lies beyond the Pet Sematary, will he be able to resist its power? I think I’ve mentioned before that it took me a few times to really be scared by this book. I even wrote a paper on it in tenth grade, but I think that was the last time I read it before now. I haven’t read all of Stephen King’s books, probably not even half, but this is definitely the one that scared me the most. And you know what? I’m not alone: this is the book that scared the master of horror himself the most. 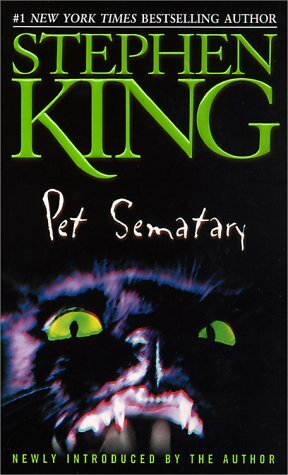 In the introduction, King writes that when he finished Pet Sematary, he thought to himself that he had finally gone too far, and put it away in a drawer, thinking no one would ever want to read it. He only reluctantly submitted it to Doubleday to fulfill his contract with them in 1983, at which point it was published and became surprisingly popular. But to this day, Pet Sematary is the novel that scares Stephen King himself the most. The story itself is incredibly tragic, which is part of the reason it’s so hard to choke down. King says that the inspiration for the story was basically his imagining all the horrifying “what-ifs” from parenthood coming true—if that gives you any idea of the horror this story contains. I would never say not to read this book, since it’s Stephen King, after all, but I would say to at least read a couple of horror novels before you read this one because if you’re a horror newbie, this one will turn you off the genre forever. Great review. I agree with you — I’m not sure this is King’s *best* book, but when I think of King books that *scare* me? This one is at the top of the list. The scene where Louis goes to the cemetery in the rain to dig up his dead son is probably the most horrific scene in any book that I can think of. I haven’t read this in years and years, maybe I’ll re-read it in 2013 now that you’ve reminded me of it. Pet Cemetery scared the crap out of me too when I read it the first time. My favorite book of his is definitely The Stand though, hands down. Mine is It, but The Stand is pretty close to the top as well! You should see the movie. The guy who played Herman Munster in The Munsters played Jud! Haha yeah I saw that Fred Gwynn was Jud! I still don’t think I’d ever be able to watch the movie though…far too horrifying for me. I’ve read this one a couple of times. The first time I read it, I wasn’t scared by it. The second time I read it (years later), I had an 18 month old son (named Grey, so close, but not quite Gage) and it seriously disturbed/scared me. Oh my god, there’s no way I would have been able to handle reading this if I had a kid of any age, but that is farrrrr too close for comfort!! Fantastic review. This one of the few classic Stephen King books I have not read. I have avoided it because I watched the movie when I was (far too) young and it scared the bejesus out of me. Haven’t pick up the book for that reason alone. Thank you!! I could never watch the movie, having read the book…and I don’t blame you for not picking up the book after such a traumatic experience! This one is really scary, and also really tragic as well. I love it, it’s one of my top Stephen King books and top horror books, but I never ever want to read it again. I don’t even have the book in my house any more.